Substitute Graham Cummins salvaged a point for St Johnstone with a last-minute goal against Inverness Caledonian Thistle. Ryan Christie's drilled shot gave the visitors an early lead. 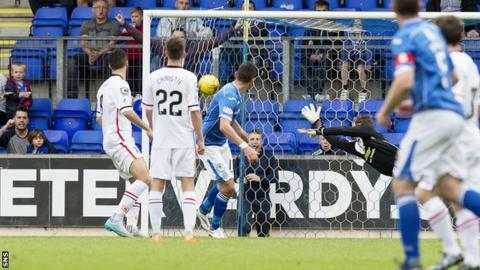 Christie came close to adding to Caley Thistle's advantage and Michael O'Halloran had an effort saved for Saints. And, with time running out, Cummins headed in Joe Shaughnessy's delivery to restore parity. A draw gives both sides a first Scottish Premiership point this season. But for Inverness the result may well feel like two points dropped having dominated for much of the match and led for so long. They took the initiative when a mix-up at the back for St Johnstone was picked up by Dani Lopez, who played in Christie. The attacking midfielder cut into the box on the left-hand side and, from 15 yards, fired across goalkeeper Alan Mannus into the net. Christie continued to be the danger man for Inverness and almost doubled their lead. He made a surging run from the right only for the Saints defence to block midway inside the penalty box. O'Halloran found space with some intelligent play and forced a decent save from Owain Fon Williams. Inverness threatened again on the stoke of half-time, Andrea Mutombo flashing across the face of goal with no takers. The visitors started the second half as brightly as the first and had a great chance following a corner from Ross Draper. The ball was headed down by Danny Devine and a scramble ensued before the ball was eventually cleared by the hosts. Christie came close again when he spotted Mannus off his line and tried a shot but the keeper made an excellent one-handed save. Cummins replaced Simon Lappin and his contribution proved crucial for St Johnstone as he connected with Shaughnessy's cross from the right to level the match. Match ends, St. Johnstone 1, Inverness CT 1. Second Half ends, St. Johnstone 1, Inverness CT 1. Ryan Christie (Inverness CT) is shown the yellow card for a bad foul. Substitution, Inverness CT. Nathaniel Wedderburn replaces Andrea Mbuyi-Mutombo. Goal! St. Johnstone 1, Inverness CT 1. Graham Cummins (St. Johnstone) header from the centre of the box to the bottom left corner. Assisted by Joe Shaughnessy. Substitution, Inverness CT. Alisdair Sutherland replaces Dani López. Corner, St. Johnstone. Conceded by Greg Tansey. Corner, St. Johnstone. Conceded by Liam Polworth. Corner, St. Johnstone. Conceded by Andrea Mbuyi-Mutombo. Attempt saved. Ryan Christie (Inverness CT) left footed shot from the left side of the box is saved in the top centre of the goal. Corner, Inverness CT. Conceded by Michael O'Halloran. Attempt saved. Murray Davidson (St. Johnstone) header from the centre of the box is saved in the bottom right corner. Substitution, St. Johnstone. Graham Cummins replaces Simon Lappin. Corner, Inverness CT. Conceded by Tam Scobbie.